In assessing the value of a recruiting class we weigh multiple factors, the most important of which is whether or not an athlete is likely to have any kind of immediate impact at the collegiate level. Our ratings take into consideration new U.S. high school pickups, foreign recruits and both JC and 4-year transfers, but do not include earlier recruits coming back from a redshirt or other kind of ineligibility. It wasn’t enough that Petros Kyprianou could take comfort in having last year’s top NCAA decathlete return: he went out and really bolstered the Bulldogs’ 10-event power. From the domestic side came the year’s top scorer, Kyle Garland (7562 with the Junior implements), while the international side provided Estonian Karel Tilga (8101 with the international ones). Garland also has 13.80/13.69w and 7-2 credentials, while Tilga can claim marks of 6-10¾, 24-1½ and 227-2. But that’s not all, with Elija Godwin (10.52w, 20.71, 45.83) bolstering the sprint corps. He’s a 4-time All-Am (1 in the 200, 3 in the 400). This is Georgia’s best showing ever, having previously been No. 5 in ’97 and No. 2 in ’04. The Aggies return to the First 5 for the first time since ’12. 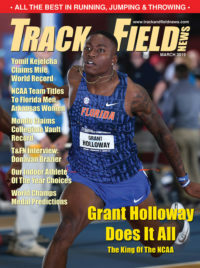 Pat Henry picked off a trio of performers from this year’s All-Am list, headed by long sprinter Jamal Walton (20.57, 44.99), a 3-time A-A in the 400 (including a No. 1 as a junior) and also a 200 A-A. He’s joined by the No. 2 javelinist, Nick Mirabelli (227-10) and the No. 4 triple jumper, C.J. Stevenson (50-6¾, plus 24-3). Estonian vaulter Robin Nool has cleared 17-6½, while transfer Carlton Orange brings 1:46.96 halfmile skills. The Jayhawks make the first 5 for the first time ever as Stanley Redwine nabbed a trio of All-Americas. Zach Bradford’s 18-2½ not only made him the No. 4 All-Am, but also moved to him to No. 8 on the all-time prep list. He’ll be joined by the No. 3 triple jumper, Treyvon Ferguson (50-9½) and double-AA Patrick Larrison (67-6, 210-9) who rated as No. 4 in the shot and No. 2 in the discus. The best of the track pickups was A.J. 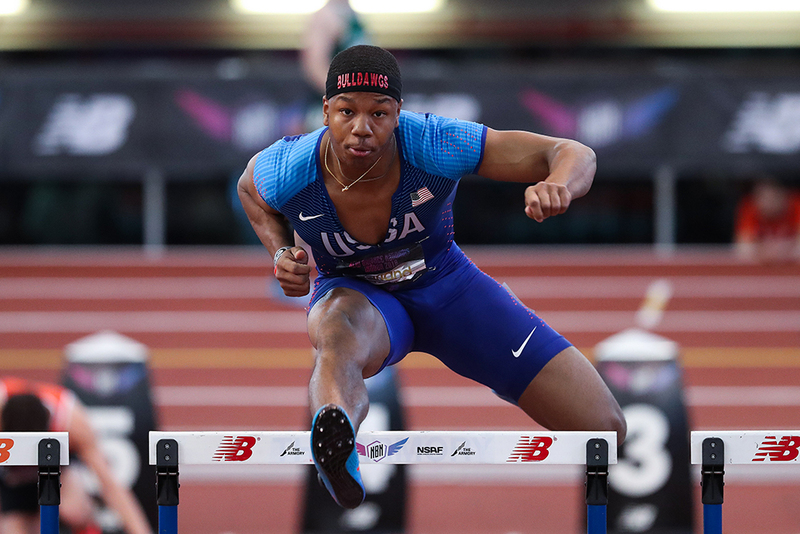 Bennett, at 37.07 the year’s 12th-fastest 300 hurdler. Things are looking up for Avery Anderson in his second year as the Bruin head, as he scored a pair of outstanding vertical jumpers. Sondre Guttormsen, a Norwegian who prepped in California, vaulted 18-10¼ to become the best prep vaulter ever not named Mondo. As for Lee, he high jumped 7-3 to claim the No. 2 All-Am spot. The jumps corps will be boosted by newcomer Alex Enos (24-½) and transfer Harrison Schrage (25-3¼). Jett Charvet is a 1:50.79 performer in the 800 and speed will be provided by Seth Holloway (10.39w, 21.01w). He has football obligations, but Otito Ogbonnia can boast 68-6 & 187-11 throws skills. A trio of All-Americas bolster Caryl Smith Gilbert’s Trojans. Yearly list leader Nate Patterson (7-4) was the No. 2-rated high jumper, while Ayden Owens (13.69, plus 36.65) was the 110H runner-up. Owens won’t be the fastest new hurdler on campus, though, as ’17’s No. 4 Noah Green (13.51 plus 36.28) is also along for the ride. Owens is also a 7424 decathlete. Speedster Eric Allen (10.43, 20.91) rounds things out. HS Athlete Of The Year Mondo Duplantis (19-10¼ HSR). Sprinter Austin Kratz (10.33, 20.74) was the No. 3 A-A in the 100 and No. 2 in the 200. Carlin Naisant (215-3) claimed No. 5 in the javelin. Plus, ’17 DT leader Anthony Washington signed on as a transfer. No. 1 putter Tyson Jones (71-8¾ HSL, plus 195-6) and No. 4 long hurdler Miles Green (51.07 HSL). Double No. 1 All-Am Anthony Schwartz (10.09(A)/10.07w, 20.47/20.41w), who has football obligations. For the XC powerhouse, top-rated miler Brodey Hasty (4:00.05 HSL, plus 9:00.38) and No. 4 in the 2M, Ryan Raff (8:51.66).